beach at Back Bay NWR, VA.
Betsy Hilbert was born in Brooklyn in 1941, but has lived in Miami since the age of five. She has her B.A. and M.A. from the University of Miami and her Ph.D. from the Union Graduate School. Hilbert has taught in the Independent Studies Department at Miami-Dade Community College since the mid-sixties, and she is known for her scholarly work on women's nature writing as well as her literary essays about the natural world. 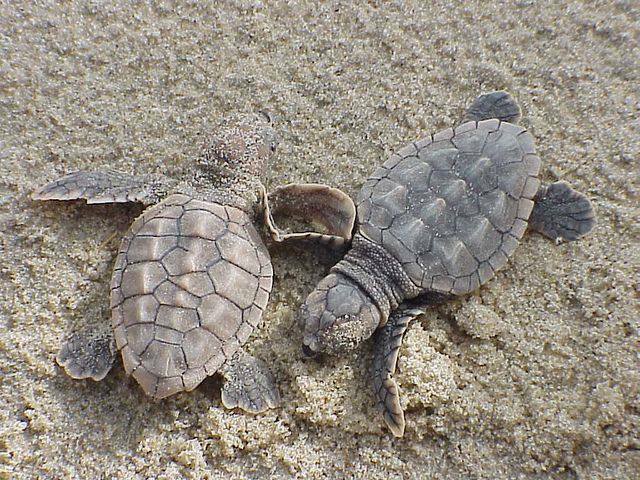 In the following essay about her efforts on behalf of endangered loggerhead turtles, she conducts a careful examination of the complexities inherent in human efforts to restore the natural world. She concludes that, even a universe that is "already disturbed" and in a region where the future is already written in concrete, her best choice is to work on behalf of the turtles. I’ve loved being outdoors for as long as I can remember. My parents raised my family in bustling suburbia, in Ocean County New Jersey, along the Jersey shore. I didn’t realize until I was a teenager, how unusual it was for kids to spend all day, every day (school aside) playing in the woods, coming home dirty, exhausted and exhilerated! That’s what my sister and I did, cultivating a deep affection for nature and critters of all shapes and sizes. We looked for Box Turtles in our backyard fields, flipped logs in search of salamanders, examined tree leaves and bark. Today I live just outside of Philadelphia, on a standard-size quarter-acre suburban lot. I’ve transformed the backyard into wildlife-friendly habitat, with native shrubs and multiple bird feeders, providing much enjoyment from the back porch. But I don’t get to spend much time on the back porch – I’m too busy volunteering at John Heinz National Wildlife Refuge, guiding bird walks, developing environmental education programs, creating marketing-outreach materials, fundraising and serving on the Friends of Heinz Refuge board of directors. I discovered Heinz Refuge about 10 years ago, when I lived in center city Philadelphia and became a birder. The Refuge was the most convenient place to spend a few hours birding. I’ve since travelled to many birding hotspots around the U.S., and outside the country, but Heinz Refuge remains my favorite place. I am endlessly inspired by the Refuge’s year-round diversity of species, supported by myriad habitats. I’ve met many wonderful people there, who appreciate the beauty, peace and inspiration of the Refuge as much as I do. I’m an avid reader and writer, and being involved in Friends of Heinz Refuge provides ample opportunity for experiencing the natural world through words. I look forward to exchanging ideas about this “Wild Read” selection. Debbie Beer,sounds as if you are clear about human intervention in the future of the natural world, that science and education have your trust. Was it always so? Do you ever have doubts that education and experience will be enough to make a difference? Or wonder if our efforts may just be more disturbance that nature must evolve through? Hello Gloria - Those are excellent questions, and not easy to answer. I guess science and education do have my trust. I hadn't thought of it in those terms, but it's accurate to say so. I believe science is an ever-evolving study - that there are few absolute truths in our understanding of how the world functions. Things that we took for fact in one era, show to be different in another era. Additionally, human understanding of science is intrinsically filtered through our perceptions of the world. And our perceptions - individual and collective - are shaped by our backgrounds and experiences. I define education as a combination of information and experience - be it a university degree or 10-minute bird walk. I've always believed that education makes the difference in the way that people interact with, experience, and appreciate the natural world. How much difference does education make? Impossible to define and quantify, but it is of utmost importance. 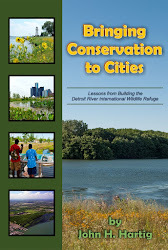 Education is crucial if our goal is to inspire people to protect and conserve natural resources. People do not protect what they do not understand. And they do not understand that which they have no idea or experience. I have no doubt that nature will need to "evolve through" many of the efforts we implement to try and protect it. And perhaps even our efforts to protect it will be the fatal ones. We'll never really know, except in the very short-term. The future will certainly be assessed through a different lens than it is right now. As a relatively short-lived creature on this earth, I do my best to advocate for what I feel are the right things to do, given the circumstances that I perceive to exist. I've always been a "glass half-full" kind of person... this doesn't mean my eyes are closed to the evils of the world. Rather than lamenting hopelessness, I focus on actions that make a difference for good, and take pleasure in seeing people of all ages and backgrounds connect to and embrace wildlife! Thanks for the conversation, Gloria.